In this new three-part series, we take a look inside Science Lab classes at BASIS Independent Silicon Valley to see how teachers are creatively demonstrating lessons about blood spatter, DNA isolation, Newton’s Laws and…elephant toothpaste! 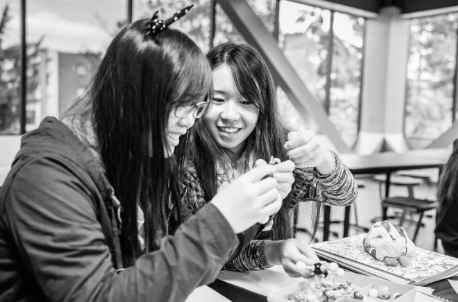 BASIS Independent Silicon Valley's STEM-focused Liberal Arts curriculum is designed to give students a deep foundation in all academic disciplines and incorporate critical thinking, problem solving and creativity...even in the younger grades. 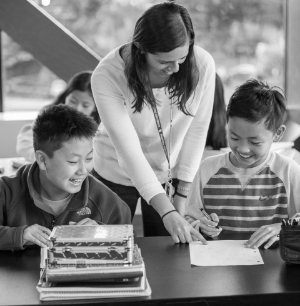 Our science program is no exception to this philosophy – applied learning, critical thinking and creativity begins with our 5th grade Introduction to Science course and extends to our high school Honors and AP-level science courses. In this series, we cover Introduction to Science and Biology. Fifth graders have one more reason to love Friday’s at BASIS Independent Silicon Valley: Ms. Elizabeth Holve’s Introduction to Science class. Aside from watching a colorful foamy substance explode from a bottle, the purpose of making Elephant Toothpaste is to demonstrate how exothermic reactions occur. In other words, it shows the students that heat is created when the yeast mixes with hydrogen peroxide and attempts to pull oxygen molecules away from the hydrogen. Pretty cool! Ms. Holve also teaches 7th grade Biology. During the Blood Splatter lab, students are given a dropper with fake blood (thick red concoction) and were asked to squeeze a drop of blood at different heights on a piece of paper, then measure the diameter of the blood splatter. Ms. Holve then created a mystery splatter (water with food coloring), and dropped it at various heights. Students were asked to determine at which height she dropped the mystery splatter by examining the diameter of the splatter. During a recent Growing Mold lab, each 7th grader was responsible for monitoring three slices of bread. Each slice of bread was individually wrapped in a plastic sandwich bag, and placed in various environments. Some students left their bread slices in a cabinet, refrigerator or just sitting out in the open. At the end of the four week examination period, students examined the association between the amount of mold on each slice of bread and the environment the bread was in. The goal of the Growing Mold lab is to open the minds of students to how different environments effects the outcome of mold growth. We Asked Ms. Holve to Describe Her Favorite Experiment. Stay tuned next week for the second installment of Beyond the Microscope: Bringing the Sciences to Life Through Labs & Experiments. We'll go further into biology by checking in with Dr. Anuradha Murthy to examine her approach to teaching students who are eager to master subjects like DNA Isolation Osmosis (using a potato! ).